If your party's guest of honor is indecisive, or you're hosting for multiple children who just can't agree on what kind of inflatable to get, stop trying to decide! 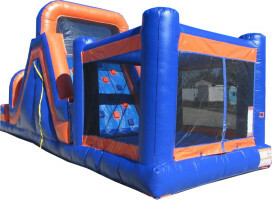 The 3-n-1 Bounce Climb Slide is the combo bounce house with it all. Whether your guests want to bounce the day away or prefer racing down a slide over and over, you can now keep them all happy.